Is Tidal Changing How Fans Talk About Music? : The Record Technological innovations like streaming are shifting how music gets released today — but artist exclusives are also changing the way fans process today's most popular tracks. Is Tidal Changing How Fans Talk About Music? 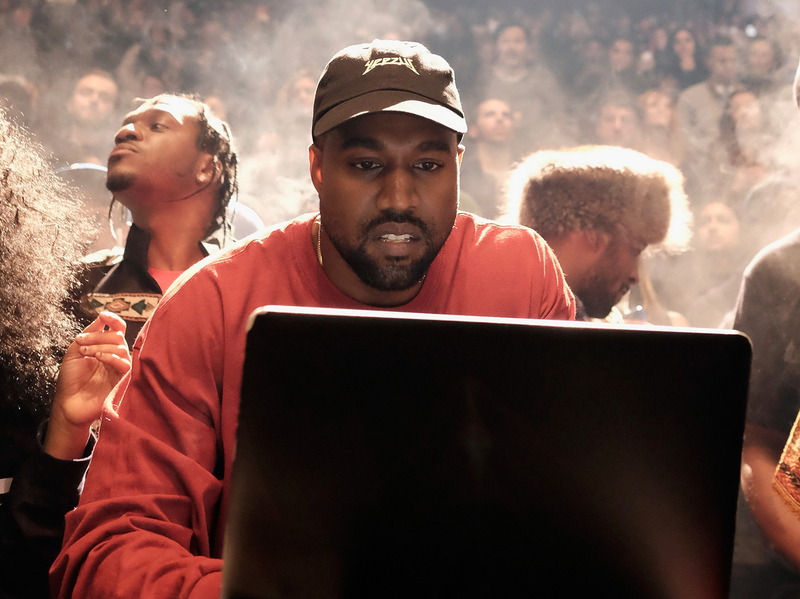 Kanye West at a laptop during his Yeezy Season 3 fashion show and album debut at Madison Square Garden in New York Feb. 11. The technology of the day has everything to do with how you get your music — and the music business is pushing more and more toward streaming. With services like Spotify, Pandora, Tidal and Apple Music, there are a bunch of companies that want your ears — and your money. And a lot of those companies are trying to get exclusives from artists. Two albums that are very popular right now were released on Tidal, a streaming service owned by a group of artists headed by Jay-Z. One of those albums is near the top of the charts right now. The other isn't there at all. Rihanna's song "Work," featuring Drake, is No. 1 on the Billboard Hot 100. "Work" appears on Rihanna's latest album, Anti, which was initially only sold through Tidal, where she is one of the co-owners. And Anti went platinum. But the way that Anti achieved that feat wasn't through Tidal. Last year, Rihanna signed a deal with Samsung that was reputed to be worth $25 million. Part of that deal was that Samsung gave away a million copies of Anti to fans. Tidal has stated that it sold almost another half million downloads of Rihanna's album, but those free downloads got Rihanna to platinum. The Recording Industry Association of America (RIAA) determines whether an album goes platinum or gold. And it recently changed its rules to include streams in its accounting. So the Samsung giveaways alone gained Anti platinum status less than two days after it became available. This all meant a big win for Rihanna: She received a huge sponsorship deal, a big wave of interest in a company of which she is a part owner, and the cachet of becoming a platinum artist in an incredibly short window of time. The Rihanna project gave a big boost to Tidal's visibility. And that's something the company still needs. As a paid service, it's lagging behind its competitors. Spotify has more than 75 million users, including 20 million paying subsrcibers. Apple Music has about 11 million. In the middle of last year, Tidal had only about a million subscribers. Now Kanye West has put Tidal even more front and center. The album that has a lot of critics and fans wrapped up right now is West's The Life of Pablo. To hear it legally, you've got to pay up and have a Tidal membership. Like Rihanna, West is a Tidal artist-owner. And like Rihanna, he is definitely making money on his release both as a creative force and a businessman. Tidal's subscription numbers have reportedly surged since The Life of Pablo was released. Despite all of the publicity surrounding this album, The Life of Pablo isn't charting because Tidal doesn't report its streams to Nielsen Music, the company that determines the Billboard charts, and it has not been certified gold or platinum by the RIAA. These days, Nielsen Music tracks sales in all formats (downloads, CDs, vinyl and so forth), as well as streams from services like Spotify, Beats Music and Rhapsody, video views on platforms like YouTube, and radio streams both online and on terrestrial radio. They have a proprietary algorithm that incorporates these various media into their chart formula. So in the case of The Life of Pablo, an album at the epicenter of the cultural conversation isn't part of the official historical record in certain ways. All these exclusives mean that music fans may have to start budgeting for multiple subscriptions to hear their favorite artists' recorded work. Just as you may already be setting aside money for Netflix, Amazon Prime and Hulu to see all the movies and TV series you want, you might now be stashing money aside every month for a combination of, say, Spotify, Apple Music and Tidal. Even while some of these services, and especially Tidal, seem to be betting that artist exclusives will be their path to market share, it isn't always working out so well for musicians — even the extremely popular ones. Exclusive streaming deals have their own ramifications. Drake's 'Hotline Bling' Aims At No. 1, And Misses. Why? Take for example Drake's inescapable "Hotline Bling." Last fall, when the video for "Hotline Bling" was released, Drake was saying how much he was thirsting for a No. 1 on the Billboard Hot 100. He wrote about his desire very publicly. Drake's team gave the video to Apple Music as an exclusive — and the strategy backfired, at least in terms of getting him to his goal of being No. 1. Apple doesn't report its video streams to Nielsen Music, so there was no chance of the song making the top spot as long as it was an Apple exclusive. Meanwhile, there are reports that Samsung has been in talks from time to time about buying Tidal — and sources were telling The New York Post this weekend that those talks have resumed in earnest.